Stunning, high quality bathroom installations, expertly fitted to the highest standards. 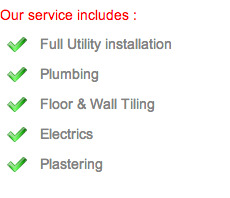 At RJG we have a full range of services on offer, specifically catering to bathroom installations. Ensuring that we can provide a bathroom solution for you. We really do cover it all. Taking away the stress of having to source tradesmen for various jobs we cover it all with our comprehensive service, keeping a high standard throughout and your costs down in the Aylesbury and Thame area. From simple utility replacements and repairs to full redesigns. RJG Flooring from Aylesbury covers it all. We can supply and a create a fully customised design from the ground up. We also carry out any electrical work required in the bathroom. We have a variety of high quality product suppliers and the workmanship to match in the Thame area. No matter how small or large a bathroom project is, they all include a free consultation with one of our experts. They can then assess the requirements and discuss with you the best working solution for your needs in the Aylesbury and Thame area. We are proud of all our work undertaken in the Aylesbury & Thame, and take great pride in delivering high quality results as standard that you can be proud of.